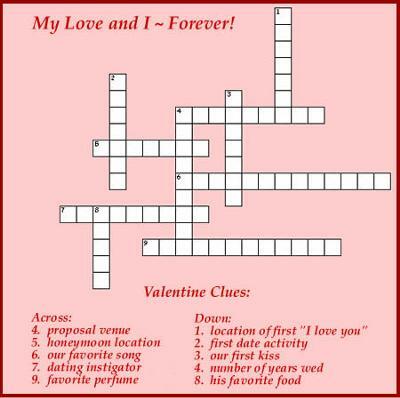 Valentine Puzzle - Make Your Own! For Valentines Day fun, create your own Valentine puzzle and games! Valentine's Day is a day for romance, but it should also be a day for fun. There are quite a few ways that you could add a bit of adventure and fun to your Valentine celebration with a little clever thinking and ingenuity. To start with, you can create a unique Valentine puzzle. There are a number of free crossword puzzle generator tools online. The one I used was here at Discovery Education and it did the job fairly well. I copied the puzzle and pasted it into a graphic program and gave it a colored background to make it have more of a Valentine look. I have to admit, I kind of got hooked on the concept of creating my own crossword puzzles and have since found several other free crossword puzzle generator tools that I like even better. I'm definitely going to be using this idea for future occasions for sure. Another fun idea for Valentine's Day is to have a Valentine scavenger hunt. Cut out a number of hearts from colored paper. You can use the traditional pink, red, and white like I did, or you can use any combination of colors if that's what you have on hand. Just remember that if you are going to write on the paper, you'll need a dark, heavy pen or marker for the print to show up on darker colored hearts. set of clues that lead to secret places around the house, yard, classroom, (wherever) where you've hidden the prepared hearts. Each heart could contain a clue leading to the next one, with the final location containing the final Valentines Day gift or prize. Another option is to simply write sweet thoughts about the person and hide them in locations that you know they will naturally and randomly find them throughout their day. This is a great way to express appreciation for those little things that make a person special. Some ideas for expressions to include are ways they make you happy, character traits that you love about them, appreciation for their efforts, etc. 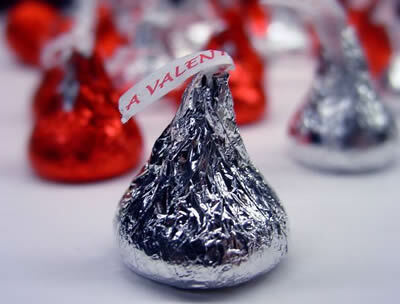 I like to get Hershey kisses and attach one kiss to each heart to go along with the Valentine message or clue. That gives some added incentive to find the most clues. If you want to create a scavenger hunt for your sweetheart and you live in the area where you met, began dating, etc., you could really go all out and create a progressive scavenger hunt. This takes a bit more planning and ingenuity, but it would really add to the Valentines Day fun! Hope you like some of these Valentines Day fun ideas and can put them to good use. Comments for Valentines Day Fun! Thanks for sharing such a cute idea for some Valentines Day fun! I'm glad you passed on the info about making custom puzzles. I can think of plenty of ways to use this myself, for my Sunday School class, party games, etc.